EACH TIME I’VE OFFERED Ricki Carroll’s fabulous mozzarella/ricotta cheesemaking kit in a random drawing, the response has been overwhelming. Consequently I’ve ordered another kit for this month’s giveaway. Who’d like a chance to win it? It was Ricki Carroll who introduced me to the pleasures of homemade cheese. Her kit contains enough vegetable rennet and non-gmo citric acid to make 30 batches of mozzarella. Also included is a thermometer and a large piece of high-quality butter muslin. I use butter muslin for straining a number of cheeses, including the Greek-style yogurt I make almost every week. 1. Subscribe — if you haven’t already — to my weekly email newsletter. I’d be ever so grateful if you clicked the “like” button, too. The drawing expires on Friday, May 18, 2012, at 11:59PM. As always, I’ll use the little number-gadget at Random. org to select a winner. The winner will be notified by email. I am a subscriber and I wanted to say thanks for the info on layering, my neighbor and I are going to try it! My favorite cheese at the moment is Robusto! I just subscribed, and I would love to be entered in the drawing. would love to see this put to use by my family. Love most cheese, but would love to start making some at home. Subscriber, and I love many cheeses…mozzarella, brie, raclette and spanish drunken goat are some of my faves. Love your blog! I love ALL cheeses! My least favorite is Blue Cheese. Thank you for another giveaway. I love Swiss and would love to learn to make Mozzarella. I’ve made soft vinegar cheese with herbs from my goat milk, but would love to make more cheeses! I’m a cheese-a-holic and lovin’ it! I love nearly all kinds of cheese, but use mozzarella and asiago the most. Ricotta makes a great breakfast mixed with various fruits or other goodies. Thanks for your great column, full of useful ideas. I look forward to it each week. I love mozzarella cheese the most, the fresh one, of course. My first taste of it was at a Greek house, with tomato slices and basil, drizzled with olive oil. Thanks for your newsletter! I learn a lot. Pick a cheese? Impossible! Homemade dill garlic mozzarella would be up there! I subscribe to your newsletter and follow you on FB and Twitter. When my grandson once asked me why Emmenthal was my favorite cheese, I answered, “Because it’s ‘Swiss-ier’ than Swiss!” He thought that was hilarious! Mmmm Mozzarella! I think Mozzarella may be my favorite. I also like Chevre goat cheese. I love all cheeses. Mozzarella with tomatoes and basil… Nothing better! My favorite cheese is mozzarella 🙂 Thank you for a chance to win Ricki Carroll’s fabulous mozzarella/ricotta cheesemaking kit! I am a current subscriber to your newsletter! I love it!! Thanks for providing such awesome information 🙂 I love both Ricotta and Mozzarella..They are both fabulous on Pizza..I’ve never had homemade before. I would have difficulty deciding which cheese I would prefer. Both are perfect for our spring and summer produce! Goat cheeses are of interest to me as well. I am on the path of preparing nutritious foods for delivery and am fermenting vegetables, making yogurt and making cheeses is a natural next step. I want to make everything by hand! What a wonderful way to show love! I love it! I was just talking to my husband about making Mozzarella and him giving me a kit to get started. We live in a rural area and good cheese is hard to find. I LOVE YOUR WEBSITE AND NEWSLETTER. Super love your website! Already a subscriber and would love to make my own cheese..we love to do yogurt now, so that would be another fun yummy for sure! Yippie! I just discovered your website a couple of months ago and joined your mailing list the other day. We just moved to a fixer-up after 20 years of apartment life so I am really new to gardening, but really excited. Your site has been so helpful and I love the recipes. Picking one favorite cheese is hard! I love them all. I never thought of making it on my own so I think mozzarella sounds like a great way to start learning how to make cheese. A friend served me fresh homemade Ricotta on a homemade baguette, topped with avocado, drizzled with local honey and red pepper flakes…Fabulous! Already a subscriber :). I haven’t met a cheese I didn’t like! I’m first-generation Italian, so of course I have to say Parmisano-Reggiano, the king of cheeses! I remember my Italian nonna making scarmozza, a regional type of mozzarella, and I would love nothing more than to make my own mozzarella to go with fresh tomatoes this summer. Thanks for the chance to win this wonderful giveaway, but if I don’t win, I’ll still be looking into getting this kit. Oh, and I am a loyal subscriber! Mozzarella is fav …I’ve always wanted to make cheese! I am a current subscriber- my hubby is insanely addicted to Ricotta cheese- by the way. I recently discovered your wonderful newsletter, and have been sharing it with friends who also love natural gardening and home style recipes and tips. In our house cheddar and mozzarella are two favorites. I am a current subscriber who LOVES your newsletter and who loves my own garden! I love goat cheese and cambozola any given day. I just want to say, I very much enjoy your emails. I have learned so much and your recipes are awesome. Thanks for your time and knowledge. As for cheese, I would have to go with mozzarella. I’d love to win this cheese kit. My grandchildren would love making cheese! I have always wanted to try this kit! My favorite cheese? It’s hard to pick just one…it would be like trying to choose a favorite child. I am a current subscriber to your newsletter! My favorite cheese is fresh mozzarella. Never met a cheese I didn’t like, tho’ some more than other. I make yogurt, so mozzarella should be too big a stretch. Thanks for the great newsletter! I love cheese. Have been wanting to try to make my own mozzerella for some time. I love fresh mozzarella, but really love most cheese! I am a subscriber. Enjoy your newsletter! Hi Kevin, I absolutely love Havarti Cheese. I think that it is my favorite which is hard to choose since I love cheese of all kinds. They are very versatile to any meal, snack or wine. Thank you for your newsletters for they have help open a new door in my life. Hello and thank you for another chance at the drawing. I love fresh mozzarella. It’s my favorite! I am a subscriber who loves cheese and would really enjoy the reward of putting this kit to the test. Cheese??? LOVE IT ALL! Nice Idea, this fun contest. Thanks! And BTW, your website and info are an endless delight. I look forward to receiving it and always open it right away, roam through, and set aside the goodies to digest at leisure later. It spreads the pleasure out. Love your work and inspiration! I’m a subscriber. I’d love to make fresh mozzarella to go along with the tomatoes and basil we have growing. . .Caprese Salad!!! I am a subscriber to your newsletter, and I love it-Thank you. I like cheese in any shape or form. The only cheese I have ever made is kefir cheese, would love to win a kit to try. HI, This sounds wonderful!! I am a new subscriber and love the emails, they are so informative!! All cheeses are favorites depending on the use, but a friend gives me fresh mozzarella for our pizzas and it is fabulous. I love cheese. I love all kinds of cheese. Cheese is my middle name. Well, it’s not really. But I still love cheese. This giveaway makes me happy I subscribed to your blog a few months ago. I like to use mozzarela in making pizza. Really haven’t discovered a cheese that I don’t like! The cheese making kit sounds delightful! I like many cheeses, so I can’t really say what is a favorite. Mozzarella is one of my favorites though. I am already enrolled to receive the newsletter which I enjoy. So Thank you for providing this service. Hello ! I love cheese and I love to cook. Sounds like a win/ win . Did I mention that I love cheese? And I enter every time, and one of these days I’ll win the kit! My favorite cheeses are Havarti and Muenster. Thanks! I am a current subscriber and look forward to and truly enjoy the advice in your newsletter. Goat brie – the best! I think I’d have to chose low fat ricotta, I’ve learned to make some healthier desserts with it. Particularly good is ricotta cheese beaten with a little skim milk to make it smooth and creamy then add almond flavoring and it make a great dip for strawberries. (Better than sour cream! I love mozzarella cheese! So does my family. I would love to have the ability to make it at home. I love your site. So much great info. Would love to know how to get rid of fleas naturally in the yard. It didn’t get cold enough in Atlanta to kill them. My favorite chees right now is Camberbet. I never thought of making my own cheese. Would love to win the kit. I’m new to your website and am enjoying your input on gardening and home living. Thanks for sharing yourself. I am an e-mail subscriber and would like to be entered for this cheese maker. Sounds very interesting. Perhaps this will be what finally gets me to making cheese! We make a lot of homemade pizza, so the mozzarella would be great! Hello! I would be over the moon to win a cheese kit! Thank you for the opportunity! I’m happy to say I found a cheese from my childhood. I remember my dad always stopping at a store in Pinconning, MI when we were in that part of the state. He would stock up on sharp Pinconning cheese. I started thinking about it a few months ago and the next time I was in a big Meijer store….there it was in their cheese cooler. Yes, I stocked up but I’m down to my last piece. Time to go back to the big store. 🙂 Thanks for offering this gift. I am already signed up to receive your newsletter which I very much enjoy. I would really like to make my own mozzarella. Hello – I love and have loved since I was a kid – aged Gouda spiced with Cumin. WOW I woukld love to make cheese! Any cheese, if it is cheese it is for me! Am a subscribefr and LOve Love Love your emails. Hello! My fav is goat cheese, keep trying to convince the hubby to let me get some goats to milk. He said it would be goats or him. I told him I will get back to him! Have always wanted to try my hand at making cheese! Great giveaway! very informative article about the ticks! I hate those things! My wife and I get some on us every year, but take the same precautions that you do. Always check between your toes. My mom got one there and she got real sick before it was discovered! By the way, I do love cheese and could sure use a kit! Thanks for your great weekly emails! With tomato season coming up, a bit of fresh mozz to make insalata caprese would be lovely! I’d love a chance to try making my own cheese. This way I know what really is in my cheese! Our family loves all cheeses & I’ve always wanted to learn to make mozzarella. I would love to share the process with the 4th grade class I work with in their school garden. Hands on science projects are awesome for kids. Thanks for offering an opportunity! I already subscribe and enjoy your newletter. I love mozzarella. Also love feta, blue cheeses ….just love cheese! Thank you! I am subscribed, happily. Feta and farmers are my favs. Too hard to pick just one! I’m an email subscriber and I love fresh mozzarella! I’m a subscriber and I love mozzarella cheese! I love fresh mozzarella for my pizza making evenings with m y grandchildren. Any cheese is great-but linburger!!!! But to be able to make my own -knowing exactly what is in it. is the very best. And to pass to friends——awwww’ !!!!! The satisfaction of making your own. I make my own bread so to put my own cheese would be great. Thank You.!!! Hello, I love all cheese!!! I see the kit makes 30 batches of cheese, we use a lot of monzzarella cheese here.I have been looking into making my own cheese, this kit would get me started. Thanks for the drawing. My favorite is mozzarella because my grand kids and I love making pizza and use the tomatoes we grow in Lala’s garden! I very much enjoy your blog! Thank you! Right now I am enjoying champagne cheddar but I like to try all kinds of cheeses. I have been on a tomato/mozzarella kick lately (w/a little bit of basil, olive oil and lemon juice.). I am a subscriber who enjoys your photos and benefits from your knowledge…thank you! Is there a cheese I don’t like? NO! One favorite is cream cheese because I can add herbs or veggies to it for spreads, bake with it, make candy, etc. The chance to win a mozzarella cheese kit is appreciated! I enjoy most cheeses, but I’m not wild about the veined ones like blue cheese. I guess my current fave is d’Affinois, a semi soft, Brie-like cheese. I also enjoy all the good info in your newsletter – gardening and food – what more could one want!!!! I adore fresh mozzerella and have been wanting to make it for several years now. Thank you so much..Love your site! I adore all cheeses and fresh is always a special treat! I love cream cheese used in place of butter. Would like very much to make my own. Look forward to your Newsletter every week. It is oh so good! I am very intrigued by your newsletter and look forward to reading it weekly. I am very fond of Ricotta and would like to make some as well. Love your newsletter – I look forward to it. Mozarella is my favorite. Happy Mother’s Day! My favorite cheese is Ricotta-I use itineverything from appetizers to desserts. And I’d love to try making my own! I am a subscriber and brand new mom. While I am breast feeding, my doctor has advised me to get at least 4 servings of calcium. No problem. Cheese. Cheese. Cheese. And more cheese. I’ll take any kind I can get my hands on, but some of my favorites are Brie, asiago, Boursin and of course VT extra sharp cheddar. I love raw cheddar and mozzerella cheeses. P. S. Thanks for the awesome emails! I divided hostas yesterday worked great! I bake weekly,with one of my at risk students. What a great idea! I am definetly looking into this activity. His favourite cheese is cheddar. I am a subscriber. I can’t seem to pick a favorite since I love them all. I have always wanted to make cheese at home for my family. Kevin, I really love your newsletter…it is so full of wonderful information and receipes. Thanks!! Enjoying my weekly newsy letters; so glad I found this site. This time of the year, with fresh tomatoes slowly starting to come in, I crave good mozzarella cheese. Mozzarella, I’ve made it before and it is so good! All around favorite is Edam. Though Munster is a close runner up. Pick a favorite cheese would be like trying to pick a favorite son or daughter!! They are ALL my favorites!! I am a new subscriber and enjoy all the tips you give. My all time favorite is queso fresco. already a subscriber. I love mozzarella! Love the way it melts and gets stringy but cream cheese is used so much more… hmmmmm cheeeeeese…. I thoroughly enjoy your blog as I am passionate about food, gardening and home decor. Anyway, I was lucky enough to live and work in Rome, Italy for 3 years and not only learned about the wonderful cuisine of that area of Italy, but loved living “La Dolce Vita” as well. I have never attempted cheese making, but that would seem like a perfect next process in my culinary adventures! I LOVE cheese, our family favorite is cottage cheese, and we use fresh mozz weekely for our “family fun nights”. Love your newsletter, it is so hard to find a gardening journal so packed with useful information for our area. Thanks for your hard work! Oh the list of comments is long already!! My favourite cheese is old cheddar. Thank you for the hosta dividing info. Helped me a great deal this spring. I’ve only made the mozzarella, following your recipe and it was really good. Your site is very inspirational. I look forward o your postings. Don’t Stop. I’m with the lady above who never met a cheese she didn’t like. Love eating warm apple pie with a slab of sharp cheddar on top! I’m a subscriber and I think it would be great learning how to make cheese! Hi, I am subscribed, and I enjoy reading…I am really interested in making mozzarella, I could eat it every day! Have a great day! Hi! (I’m back!!!) All cheese is wonderful!!!!! (and your mozzarella was delicious!!!!!) See you soon!!! depends on what I am going to use it for. Subscriber here who has tried and failed at Ricotta so I’d love a kit…..and love the Blog. Hello, I am a new subscriber and wanted a chance to win your cheesemaking kit. Love both kinds of cheese! Hi! I’m a subscriber and we love ricotta cheese! We also love your newsletter! Really, couldn’t pick a favorite. Love them both for different reasons. Would love to try a kit! I love both kinds of cheese! Yogurt too! It’s a tie for me. Cheddar and Monterey Jack. But my luck at making Mozzarella has been really bad. With this kit I might have better luck! I’d love to win it!. Thanks for your newsletter. I love all cheeses, but I especially like spicy cheeses. And I love mozzarella, especially with the fresh tomatoes from my husband’s garden! I’m already a very pleased subscriber!! I just tried the easy popover recipe – DELICIOUS!!!! Love both kinds of cheese. I already subscribe and I love Mozzarella the most! I loooove mozzarella, particularly on a grilled sandwich with basil and tomato. It would be great to win this kit and learn to make my own. Creamy goat cheese on summer salads is so yummy! As much as loving all cheese, I love your newsletter! It’s everything I adore, you bring nature and fabulous recipes into harmony, thank you! A lot of people would like to have the cheese making kit, myself included. Really like your website. I am a subscriber and i love ricotta. Already a subscriber. Like all type of cheese. This is an Italian family so, we have the basil & tomatoes growing and of course virgin olive oil ready to pour! I love this newsletter and read it as soon as it comes out. I get such great tips and will be making your veggie bean burger this week. I love cooking and gardening. I have a small garden in my backyard which include veggies, herbs and flowers. I usually grow peas, onions, cucumbers, squash, tomatoes, peppers ( variety) zucchini, just to name a fews. I also have started a strawberry and blackberry patch,which the wonderful animals seem to enjoy. What is better than going out and picking your veggies that look good, then making dinner for your family based on what you grew. I never made cheese, but would love to learn. Thanks for the opportunity. First off love your weekly newsletter, it is like a breath of fresh air. As a Sweetgrass vendor I would love to figure out how to make a poster to put in my booth for my customers to all find out about you. How do I decide which cheese I like, wow depends on the recipe. I made one and added Jalapenos, ooh it was awesome. As with so many others would love to have the cheese making kit. Hope to see you at the Mother Earths News fair the first weekend in June. I’m a recent subscriber and just LOVE IT! And I’ll have to go with fresh mozzarella…. its so versatile! I want to make cheese. I’m a recent subscriber who learn more every week. Cheese is my favorite way to get dairy in my food plan. Any type is great but favorites include Mozzarella, Gouda, and goat cheese. With my cheese loving family coming for a summer visit it would be great to have homemade cheese with them. I’m a subscriber, and I love mozzerella! mozzarella with fresh basil and tomato from the garden! The cheese guy at Honest Weight got me hooked on the too-expensive but oh-so-wonderful raclette de savoie. Fortunately, I don’t live near enough to the food coop to indulge myself as often as I might otherwise be tempted to do! I’m already a subscriber, and would love to try homemade mozzarella. I’ve been a subscriber for 3 months and I look forward to your posts! It’s a great site. I’d love to be entered in your drawing and I love all cheese; choosing a favorite would be like choosing your favorite child! I just can’d do it! I am a subscriber and I love fresh Mozzarella! Just want to take this opportunity to say thank you for sharing your wonderful garden and garden tips with everyone. I love following the progression of your garden and share your tips with my gardening friends. Thanks for all you do. Cheese…I have to admit that Jarlsberg is my very favorite cheese although I love and eat a lot of different cheeses (except Lindenberg…can’t seem to get past the smell), and would love to learn how to make cheese. But mostly I wanted to let you know how much I enjoy your blog and browsing through your site. I love all cheeses and love trying out your recipes! Awww, just realised my email address was wrong but Ive still been getting the newsletters …strange! I like most cheeses but am partial to bleu cheese. I’m f rom Vt so I’d love to learn how to make cheddar. I’ve seem Mozzarella made on tv and would love to try it. Love the posts, and have already been using them every week! Thank you so much. Love all cheeses, so very excited to try! thanks! I have finally found goats milk at a reasonable price, close to home and I am able to visit the nannys whenever I go for the milk. Thanks for the contest. Kevin, really love Mozzarella cheese, this look so easy to do. Thank you so much for your blogs/website and for sharing with all of us. You should see my apples and grapes right now, just loaded, picked a few apples yesterday to can on Monday. We have been blessed with rain the last couple of days so everything is perking up….even the weeds….Grrrrr. I love Greek style yogurt & mozzarella cheese. The newsletter is great! Pecoino Romano is the most used cheese in our house but mozzarella is right up there with it. Would love to make my own fresh mozzarella! I love the newsletter and have long wished to try my hand at cheese making, so hope I win. Thanks very much for the contest. My son and I would love to win this!! My favorite cheese is Feta! Right now I am loving queso fresco, manchego, and some very sharp cheddars. My favorite cheese of all time has to be Cougar Gold from the WSU Creamery. To. Die. For!!! Yikes….which is my favorite? Very hard to say I really love cheeses of all kinds!! I have a little bit of a frenzy whenever I go to Trader Joe’s since they have a great little selection of cheeses…loved the Chocolate Cheddar!! And the Brie and Asiago…I could go on! Thanks for offering this great giveaway!! I love your newsletter!! Hello! Please add my name for a chance to win the cheese making kit. I enjoy receiving your emails. Cheeeeez! I don’t think I’ve ever met a cheese I didn’t like. Even Limburger! But Mozz is the Bozz. Having 3 kids, we go thru mozz cheese stix like crazy. I am already on your email list and love your newsletters. I’m from Wisconsin and like almost all cheeses but l like goat cheese and mozzarella best. Thanks! Can’t say I have a favorite when they are all so good! If I had to pick, it would be any goat milk variety. Already a subscriber – thanks for your site! Love your site! Husband eats cheese all day with crackers- he loves a smoky cheddar, but likes the asiago, and I the Emmenthal yet the ricotta is soo famous for many applications…. Thanks for the opportunity to enter the contest!! It isn’t easy being cheesy!!! This would sure help so count me in:) I don’t know a cheese I don’t like! I am a subscriber. I love fresh mozzarella – with homemade pizza (something I’ve really gotten into). I would love to try my hand at mozzarella cheese. Thank you for an incredibly informative newsletter. although I think I’d have trouble with the one that has live maggots in it:P and some of the super furry French ones…ok, I take it back…there are cheeses I don’t think I’d like! I would love a chance to win the kit! Mozzarella is my favorite cheese, but I also love Provolone, Ricotta, Sharp Cheddar, Romano, and others. I eat cheese!!! Enter me please. PS-love the newsletter! Hi, I love your newsletter, the gardening ideas and the scrumptious recipes!! Please enter me in your Cheese Kit Giveaway, thanks. My favorite cheeses are Asiago and fresh Mozzarella, would love to buy one of the kits if I don’t win, tell us where we can purchase these cheese making kits please! Keep up the great website/ newsletter!~! I make raw yogurt from raw goat milk and am interested in making cheese too! Enjoy your newsletter. I’m a big mozz. fan. Have basil, will make and eat! Love ur knowledge….I am already a subscriber , and I am a lover of all cheeses!! 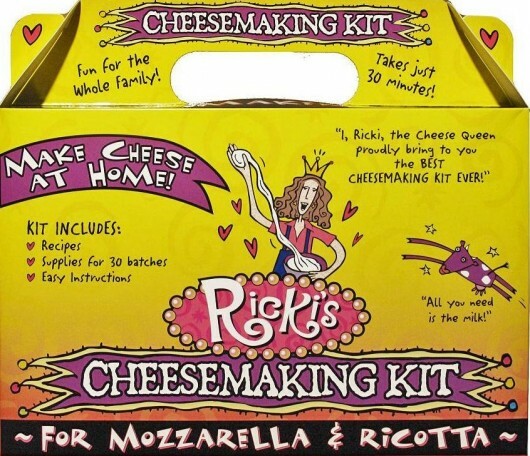 I LOVE Ricki’s cheese kits! I’m a subscriber, and I’d love to be able to win this giveaway! I’m a subscriber, and would love to learn how to make mozzarella cheese. mozzarella/ricotta I have to choose? lol me me pick me!!! please please please pretty please!! I don’t think there is a cheese I don’t like. At least I haven’t found it yet. I have been so intrigued by the recipes on the internet but not knowing where to get the products to make it. This kit looks like the ticket!! I love almost any kind of cheese and enjoy trying new ones. I guess my favorite would be either a good cheddar or a creamy goat cheese. I’d love to try the cheese making kit! If I don’t win this great drawing, will you tell me where I can by this kit from? I would love to make homemade cheese! My favorite cheese is Gouda, but I love most every cheese I’ve tried. I would love to make mozzarella cheese. It seems so easy when you did it. I just saw your link for the bread pan and I went and I just ordered it from Amazon. My favorite cheese is colby, But mozzarella is my second fav. I’d love to try making my own cheese! Thanks for the chance to win!! Is there ANYTHING better than fresh, homemade ricotta??!!??? I like a nice smoked gouda but would love to make mozzarella. MMMMMM…..
Fresh mozzarella is my favorite. Capreze salad is so delicious. Hope I’m the lucky winner. I am an avid reader of your newsletter. Keep up the good work! Love, Love , Love your site. Discovered it about 3 weeks ago and you have helped tremendously with my first year veggie garden. My fave cheese is mozzarella. I make egglpant pizza crust with fresh veggies and mozzarella. Cooked in muffin top pans these delights can make a perfect lunch or an appetizer. I’ve heard about this kit before and would love to try! Since I was named after it, I am going to have to say my favorite cheese is Brie. I’m a subscriber. My favorite cheese at the moment is smoked cheddar! I do enjoy your website. I am particularly fond of soft goat cheese. I’m sure the kit would be lovely. I’m a subscriber and we love cheese. Mozzarella and cheddars are a favorite. I’m already a subscriber and my favorite cheese right now is Farmhouse cheddar!!!! I’d love to make it at home! I am a newbie to the newsletter and enjoy it already. I was intending to make onion soup last week so was thrilled to find your recipe. Best onion soup I’ve ever made! I used Gruyere on my croutons. BUT, I enjoy many cheeses. I’m not a big fan of cheese. I’ll eat but would not go out of my way to but the rest of my family are cheese-aholics! I think they would enjoy making it. Smoked gouda is my number one fav!! If I could, I’d sit down and eat a whole wheel. Thanks for the give-away opportunity!! I am a recent subscriber and am very happy to learn that we are in the same area of NYS – I’m in Grafton at present but soon will be moving to an apartment in Albany and will need tips on container/balcony gardening. Fortunately, my apartment is on the sunny side of the building so there will be good light. Any instruction will be greatly appreciated. Please enter me in the cheese kit drawing – mozzarella or ricotta are perfect! Thanks. Subscribed to your site early this month. Love it! And would like the chance to make my own ricotta cheese! I love all cheese! Thanks for offering this! Last week I made a homemade cream cheese, and a homemade creme fraiche. Then used them to make my daughter’s birthday “cake”…cheesecake. It was fantastic. She then asked me if we could learn to make mozzarella. This kit would sure help! I’m an aged cheese lover so needless to say I do tend to love a cheese with a bite, among my favourites though I include Blue Vein, Mozzarella, Quark, Goats Feta, Brie & Camembert. Quark is on my list as a more healthy option. Love Jarlsberg cheese! Also love this excellent newsletter and website for all of the useful info. Keep up the great work. Cheers. Have been wanting to try mozzarella and grill some pizzas. Would really love to have an outside pizza oven, but not to be right now. Thanks for an interesting newsletter. I love most kinds of cheese, but very sharp cheddar is my favorite. Love fresh ricotta and mozzarella! Love you newsletter! I’m such a novice at gardening, and I have no experience with cheese making. Would love to learn how. Love most cheeses, but really love mozzarella. I love Mozzarella with fresh Basel and tomatoes. I have subscribed your newsletter about a month ago and love the tips I do get, thanks for the good work. I forwarded your website and e-mails to my father in-law and he loves it. I hope I win this sounds a wonderful tip. I loved when I made my own cheese years ago need to get back to it as it was so easy and the cheese was always fresh and wonderful! didn’t have to worry about sell by dates! My Grandson love his “pizza cheese” so I guess that is what I will start making first! Mmmm There is nothing better than fresh mozzerella cheese! I think the kids would really enjoy trying to make their own cheese. Fun! I’m a 60 year old grandmother who loves your blog. I also love cheese and you make it sound so easy. I love your newsletter and have learned many things. My 90 year old mother is probably as smart as Kevin, but doesn’t seem as excited sharing her knowledge as when we were both younger. I love your enthusiasm and positive, never fail attitude. Thank you. I love some fresh mozzarella! Either on a homemade pizza with spinach and artichokes, or with some sliced homegrown tomatoes and basil. I would love to win and try and make my own! I’m a subscriber. My favorite is cheddar–it goes with almost everything. I am a rather new subscriber to your blog/newsletter. Best “stumble upon” in a very long time. I found a recipe just like the one you posted except for the instructions. They vary a bit. BUT, I do make mozzarella often and for fun will be teaching/demonstrating making mozzarella at my local library on this Wednesday for their Lunch and Learn class. Of course I would love to win but I already have most of what is included in the kit. (No butter cheesecloth). Totally enjoy the blog and all of the great information. Thanks! I love many varieties of cheese. Mostly depends on what I am using it with, but wouls have to say my favorite is PROVALONE. Just a note to you….I love your newsletters…can’t wait for the new installments every Sunday. I’m a subscriber and I love cheese. I would love to win and make some mozzarella and make some fresh pizza for my family with it along with some tomatoes and basil for me. I have not met too many cheeses I did not like!!!! Hi – Love your site and emails. keep forwarding the emails to folks i think would love what you do to get them to sign up as well, especially my sisters!!! I love both mozzarella and ricotta!!! Though during the summer heaven is a sliced fresh tomato, sweet onion slices, torn basil leaves with ballsamic vinegar & Olive oil. Mozerella is my favorite but love to try different kinds. YUMMYYYYYY!!!! I would LOVE love, LOOOVVVEEEE to win this! Just in time for summer tomatoes with fresh basil!!! I loooove mozzarella on homemade pizza. I am already a subscriber and LOVE your newsletter. I also like making soft creamy goat cheese and yougurt cheese. I love pretty much all cheese, can’t live without it! I would absolutely adore it if I could make my own mozzarella! I love all types of cheese! I love cheese but, would really like to try making my own fresh mozza! I am a newbie to your site and enjoy it immensely! I have told my gardening friends about it too. I would love to add cheese making to my list of skills. Hopefully I’ll be the lucky one this time! Fresh mozzarella with heirloom tomatoes and basil!!! I love your site and have wanted to learn to make cheese. Hi from Texas! I look forward to your newsletter each week. Currently I’m unemployed and for the first time in my life I’ve planted a garden all by myself! ( With assitance from newsletters and reasearch!) I’ve always cooked, canned and baked but making cheese is a new journey for me. Your how to instructions makes me believe I can be successful! Thanks for sharing and may your have a blessed day! I L-O-V-E cheese, but there’s nothing like fresh mozzerella with fresh tomatoes and basil in the summer! this cheese idea looks super nice, really interested..
My husband is French, so we eat A LOT of different cheeses around here. He’d like to get goats and make chevre someday, but it sounds like the mozzarella would be do-able for me. Hello! I would love to know how to make a good ricotta. I would love to make my own ricotta! Provolone is one of several favorites at our house. This is another gouda contest. I love all cheese, but White Cheddar is my favorite. Was talking to my 87 yr old Mother about your site, and how I read how you made cheese. We both got excited and want to try making some. Our mouth’s watered at the thoughts of the first bite! Love your Blog! love your weekly newsletter, I have tried mozzarella once, with little success. I’m a new subscriber. …made your popovers and they were wonderful. I didn’t know you could even make your own fresh mozzarella! I’m italian so I’d love to try this kit! Thanks so much for your inspiration! I love your newsletters, keep them coming!! To make my own fresh mozzerella would be fantastic!!! Subscriber who loves all cheese especially mozz – want to give one of these to my daughter for her birthday. Hi, This is my very first attempt at commenting on a blog. Giveaway’s are a great motivator!! We love fresh mozzarella cheese. I enjoy baking with ricotta cheese. I was looking at The New England Cheesemaking Supply website earlier today because I’ve been wanting to make some cheese from some local raw milk. My favorite cheese, is cheese from the milk of happy, healthy cows. Mozzarella Cheese all the way !!! With some tomatoes and basil ……. yum! Goat is my Favourite cheese! We hope to have a goat one day and experiment in the wonderful world of cheese making! I love all your garden tips. I have learned so much from you. My favorite cheese is mozzarella. I would love to try and make cheese! I look forward to your newsletters! I love them & I’ve learned so much in just a few weeks! Thank you so much! I love cheese & have only found one I didn’t like, something really stinky while I was in France! New to your site and really enjoying it! Looking forward to trying your recipes for mozzarella and cream cheese. I would absolutely LOVE to win the cheese making kit. Got my fingers crossed! It is a little known fact that on the 8th day, God had a wine and cheese party to celebrate finishing creation- you know, just a little get-together with the seraphim and the archangels. Everybody got very relaxed and comfortable, and the party went well into the cosmic night as they sat around the starfire and told stories. That’s how great cheese is. I am a subscriber as well and love mozzarella and extra sharp cheddar 🙂 Thank you so much for all you do! Love the blog! Gouda is my favorite cheese. Would love to win this prize, Mozzarella would be a nice variety to the cheese we make in apuela Ecuador. Like your newsletter–Never met a cheese I didn’t like! This subscriber loves chedder cheese! Just learning to making cheese so would love a kit to help me along! Hello, I love cheese curds. Love the recipes you give us. I love all cheeses, especially Sharp Cheddar, but I do have a fondness for Mozzarella too! much. Gouda is my favorite cheese. I really like your blog. Discovered it on Pinterest. It all started with winter sowing …. than Clara’s Dandelion Salad. Have not made it yet. I got hooked on nicotiana for evening perfume… but I have not found a seller of the seeds for the white variety you mentioned. Perhaps it to late but I would really like to hope it is not. And cheese… you name it and I love them all! Maybe this will work this time…..was given an error when I tried to comment before….I’ve never tried to make cheese, but would love to learn how. I’ve never eaten a cheese I didn’t love….am not sure what my favorite is. Sure enjoy your blog……….. This would be a wonderful way to get started making cheese. Thanks for the opportunity. vegetarian bean burger truly made my day. I look forward with much anticipation and excitement to see what is going on in the garden, kitchen and house next. I found your January blog with your favorite seed sellers! All set thanks! I just made a baked gluten free mac and cheese for dinner today…it was awesome! The recipe called for two of my favorite cheeses, gouda and sharp cheddar. When I really want a nice snack cheese though, I make a finely chopped pecan, maple syrup mixture poured over a wheel of brie….heated in the oven or microwave and served with some really nice crackers and a cranberry walnut relish…that’s three but who can have only one favorite cheese? I signed up for your newsletter last week after following a picture someone had pinned on Pintrest from your website. Since then I’ve found myself pouring through your site – I love it!!! You come up with wonderful ideas and information and communicate it in a very easily read style. Thank you! Mozzarella is the best, but I like all cheese. Don’t expect to win, but I’m real glad to have found this site. I’ve already improved the health/appearance of the roses here at home, have gotten a couple of ideas to help my cooking, and gotten enjoyment just reading all the stuff you do. I like most cheeses but Ricotta is my favorite to cook with right now. Gonna look up this Rikki lady and if they’re not too dear gonna buy one of them cheese kits and give it a shot. What the heck, it won’t blow up will it?? I use both kinds of cheese for cooking veggies and pasta disher, always wanted to make my own cheese. Hello…..love mozzarella! but just like most cheese. I’m love your site!!! I love your website! Thank you for sharing all of your wonderful info. I always look at the recipes first. The popover’s were wonderful! I’ve never made cheese….but, if I was to win the GRAND “Ricki’s Cheese Making Kit” I think my mother (82 yrs old) and I would enjoy playing in our own cheese making factory. With all of the cheesie folks in this house… no doubt, it would be eaten ;^). So many good things you can do with cream cheese – it would be great to be able to make your own! I’ve never made cheese but it looks like a great family activity!!! I love gouda but would love to learn to make mozzarella and ricotta too. I am soo looking forward to refering to this site for tips and ideas as I put in a new yard and garden. Thank you for letting us into your world. I think both of the cheeses would be fun and tasty. More so coming from my own kitchen. I would love to get the kit! I am new to the cheesemaking, and have yet to try it but want to make my own little mozzarella cheese balls. Yum! Cheese! My inner mouse is excited!!! Thanks for a great, informative blog Kevin! I am already a subsriber. I love cheese of all kinds. Love your website. I love cheese. My favorite is fresh mozzarella. I like to use it in caprese salad using fresh tomatoes and basil picked straight from the garden. Drizzle a little olive oil with basalmic vinegar. Yum! Its so hard to pick a favorite cheese! I haven’t met too many I didnt like. I love a good Vermont cheddar and I love fresh mozzarella. I imagine homemade mozzarella must be one of the most delicious things ever! My sister put on to your website a little while ago, what fun to learn new things. My most used cheese is mozzarella. It’s too hard to decide which we like best. They are both wonderful. I am teaching my daughters the almost lost arts of cheese making and canning. We all appreciate your website! Thanks for offering another great giveaway! I’ve been trying a lot of your recipes lately (rosemary navy bean soup, naan, cheese danish, and chocolate mouse) — I really enjoy your site! Can’t think of a cheese I DON’T like! Thanks for your terriffic info and fun contests! My favorite cheese depends on the season and my mood: chevre in the summer, blue cheese in the fall with a good caesar salad, hard cheeses like leyden in the winter. I love your blog and newletters. I always learn something new and admire the photographs. I am a subscriber and have enjoyed (and used) many tips & hints already concerning the garden. Cheese is in the DNA of this family…so making our own would be amazing! My favorite cheese…so hard, like choosing my favorite child! A quality extra sharp cheddar would be way up there as well as fresh mozzerella (I eat Trader Joe’s packaged in oil & spices from the package…) Thank you for sharing with us your practical advice and experiences. I made the cottage cheese, have to try the others yet, but I love your newsletter and all the great info in it. Cheese!! I could live on cheese!! Love cheese! !, make yogurt weekly, would love to make cheese. Enjoy your newsletter. Hi! I look forward to your newsletter every week – and I love mozzerella! I hope I win! Thank you! I’ve never found a cheese I didn’t like. Thanks for your newsletter! I sure enjoy and appreciate it. mmmm….I would love to make fresh mozzarella! My husband was just saying how he would love to try making it so this would be a real treat!! Love learning about gardening too from your blog. We bought a house with a beautiful perennial garden, so I’m still learning what everything is. Love cheese. Can’t wait to make some! I would love to try fresh mozzarella, too. It’s so good with fresh tomatoes and basil! I also love the variety of your blog! I love ricotta! Mozzarella is good, but to me, its just a way to get to the ricotta in the cheese making process. I love your newsletter!! I tried to make the mozzarella recipe you have posted, but I didn’t have a thermometer. It ended up a little like cottage cheese. Best flavor! I made lasagne with it. I love muenster cheese. Just had the BEST Raclette from Southwind Farm in Vermont! But I never met a cheese I didn’t like. I like your newsletter. But I LOVE everything CHEESE. Everything is better with CHEESE. I subscribe to your weekly email newsletter. Just recently found your blog, and I am hooked! I have never made cheese at home, however we do consume a lot of it. This would be a great kit to try. Love all cheeses, except if they have caraway seeds!!! I’ve been wasnting to learn to make cheese and would love a kit to get me started. Love ricotta! i am a subscriber and i am lovin’ feta right now. but all cheese is glorious!! I love them both, but in summer mozarella and fresh tomatoes and basil from the garden. MMMMMMMM – nummy. first time I ever made cheese was from your recipe posted in your fab-u-lous weekly newsletter. Thanks! What a fun give away! My 5 year old and I had a great time making your english muffins for a brunch tea party, and we would love to make our own cheese! (subscriber) mmm…cheeeeese! one of my favorite commercials is when a family awakens Christmas morning to the entire living room FULL of presents. the father looks at the daughter and says, “wow, those must have been some good cookies you left for santa.” daughter replies “i didn’t leave santa cookies; i left him CHEESE”! that about sums up my relationship with cheese! LOL! I have never tried to make cheese but it sounds like it would be fun. Plus, I think my husband was a mouse in a former life so he would definitely enjoy this kit! I also would like to add that I accidentally stumbled onto your site one day. After reading your wonderful articles I decided to sign up for your newsletter and have enjoyed every newsletter I have received to date! I love all kinds of cheese. Mozzerella is right up there at the top of my faves! Thanks for the chance to win the cheese kit. I have wanted to try to make cheese for a while now. I already subscribe and love to read your posts. Smoked gouda is my favorite. Your garden looks sooooo amazing! Excited for the chance to win this as Ive always wanted to try making my own cheese. I love all cheeses! Love lots of cheeses, especially lately some local artisan offerings from Finger Lakes Cheese Trail members. I’ve played around with making mozzarella, cream cheese and yogurt. My current fave is a hard goat cheese that I nibble in tiny slivers with slivers of granny smith apples and some pecans. Best snack/light meal replacement ever! Thank you for sharing your extensive knowledge with the peons! My daughter loves white American cheese, I like provolone and asiago, my husband and son like it all. Would love to provide fresh cheese without all of the additives. We are trying to eat better, more fresh, less pre packaged. My son and I are even trying to grow zucchini and strawberries this year because I was inspired by your newsletter. We have already had 6 berries and the zuch’s are full of blooms. He is 4 and will sit on the back porch and swears he can see them growing. Love your newsletter, keep them coming. i am a subscriber! I love parmesan and asiago but my daughter loves mozarella most! I love fresh mozzarella. would love to have the kit to make it!!! I love Baby Swiss and PepperJack Cheese. I am a subscriber and would Love to learn how to make cheese. Looks like an easy way for beginners! I am a current subscriber and love your postings..I also love mozzarella cheese, especially during the summer months when it is paired with tomates and basil fresh picked from our garden. I like any type of cheese. Especially healthy cheese. Yuuuuummmmm! Cheese! Thank goodness for cows, sheep, and goats. I don’t have a favorite but the top of my list includes D’Affinois, Grana Padano, and a good grass-fed cheddar. Thanks for a great website! I am so excited to get a chance at this. I didn’t know it would be easy to make cheese. WOW doing this with my granddaughter would be a special treat. I am not picky on the type of cheese. Could be a fun family activity. Morbier slices in endive is my favorite cheese! There are very few cheeses I don”t love. Lately I’ve been gravitating to goat cheeses. I would give this kit as a gift to my daughter if I won it. She’s just begun her cheese making journey. I appreciate the opportunity to win this kit. I’m excited to make my own mozzarella cheese. Almost daily do I reference something I’ve learned from you. Thank you so much! Love mozzarella, asiago and nice sharp cheddar. Thanks for your website. I have learned so many new great things. Love the popovers. I don’t think I’ve ever met a cheese I didn’t like. My personal favorite is parmesan reggiano. Hi there. I’m a current subscriber and really like this e-newsletter. I need to restrict my dairy intake but love good cheeses including feta, bleu, stiltons and fresh mozzarella. 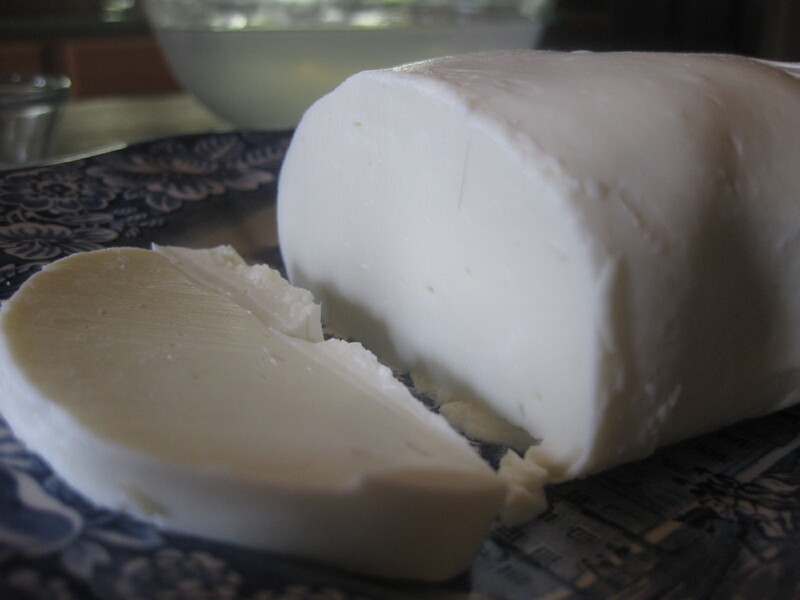 I do make my own yogurt cheeses and have been wondering where I can get the ingredients for my own mozzarella. Brand new email subscriber, first time commenter. My favorite cheese is ALL CHEESE. I can’t live without a true parmigiano reggiano, though. I have been researching this kit all day today. Would be so excited to give it a try! Thanks and love your website! Hi there! I’m a newer follower, but i’ve already found so much information in your blog/newsletters! Would love to win a kit! Appreciate your website so much! Thanks for all the great tips and the recipes! I’m a big fan of cheese. I like hard, strongly-flavored cheeses. hello. My husband and I both love using cheese for different recipes. I would love to win this. Thanks for the chance. Loove making ricotta – nothing like the fresh, moist homemade taste! Want kit…love cheese of all varieties. Thanks for the opportunity!! I’d love to make some cheese! I would love to be able to make some fresh mozzarella cheese to go with the tomatoes that are growing in our backyard veggie garden. I’m growing some heirloom tomatoes in my garden this summer and some fresh mozzarella would be pretty nice to have with it! Never met a cheese I didn’t like. I subscribed to your newsletter! I have made mozzarella, yogurt, paneer, and butter so far. Would really like to try some cheddar! I have my rennet, packets of culture in the freezer and am waiting for the cheese salt so I can begin! Thanks for the opportunity to win this! I’m a subscriber. We’ve been talking about trying our hand at making mozzarella, but haven’t done it yet. Would love to get a cheese making kit. I haven’t met a cheese I didn’t like so far! I really like Mozzerlla cheese — and most other cheeses too!!! Thanks for your weekly newsletter — they’re great! I am also a lover of all that is cheese 🙂 ~ I love mozzarella and frequently buy the “sticks” at the grocery store for a snack. Frankly I would have to attribute my bone density to the amount of cheese I eat ~ my husband would attest to that. Would love to try home made. I have perused Ricki’s site and everything looks wonderful. Count me in please…..
Love fresh mozzarella made from raw goats milk. It is sweet and so creamy tasting. Have to say my favorite though is vinegar cheese made from raw goats milk. It is so versatile. We milk 26 to 28lbs of milk from our goats so we make a lot of cheese. I really enjoy receiving your newsletter each week! Thanks for offering this super giveaway too. I think I could live on mozzarella cheese. I’ve always heard homemade mozzarella can’t be beat, but I’ve never had the opportunity to make my own. Homemade mozzarella & ricotta… They both sound delicious! Love all cheeses! Been a subscriber for a couple of months now, really appreciate the great information we get from you. Thanks so much! Mozerella is one of many favorite cheese choices with my family. Fresh mozzarella is my fav! Insalata Caprese!! Vine ripen tomatoes, fresh basil leaves, and mozzarella…the best olive oil you can find and sea salt and ground pepper! Yummy!!! I love your blog and just signed up for the newsletter. I make my own chevre and want to try making cheddar next. Hello, I love your site! I would definitely love to try and make the mozzarella, if I should win! I’d love to try this. Thanks! love your blog & if you say this is fab then I am a believer! I LOVE cheese! My late husband decided years ago that I am the head rat!! Cheddar is one I use alot as well as monzarella & ricotta & provolone & feta….okay, okay…ALL cheeses that I have ever eaten! I would love to make mozzarella but getting close enough to a buffalo could be a problem. WE LOVE PIZZA NIGHT ………… freshly made Mozzarella cheese with garden basil! yum! Thanks so much for the great info. I love all cheeses, really, but my favorite is cheddar! I am a new subscriber and am enjoying your newsletter very much. After most of my life thinking I didn’t like cheese, I’ve discovered that I do. Good thing, too, since I’m on the New Atkins diet! Mozarella is my favorite, altho I eat a lot of Swiss, too. My favorite cheese… All of them Im a cheese addict! Love your newsletter. Would love to have more gardening tips for the very Northern climates such as Alaska, where I am from. Thanks for your wonderful news letter I pass it on to all who are interested in the things you \write about. Mozzarella is my favorite. I’ve never made my own cheese, and don’t have a clue how to do it, so this kit seems like a great way to learn. (Pick me, pick me, random number-gadget thingy!) I’ve already learned so much from your site. Your newsletter is the first email I read when it shows up in my inbox. Please keep it up! I love, love, love mozzarella!!!! I got the rennet to make the cheese. Can’t wait to try it. I love trying new things. We love making cheese! It’s been a while. And it isn’t a matter of my favorite cheese, but more a matter of what cheese don’t I like! I enjoy your website and share it with all of my friends! Thanks for all you provide, to help us be self sufficient and learn more about so many things. I love cheese and am glad to have an opportunity to win the kit. Thanks for having another contest! Having lived in Switzerland, I know a good cheese. Would love to make my own! My hubby keeps talking about making cheese. I didn’t know there were kits out there. Cool! I am a subscriber. I enjoy your e-mails – was hoping this one would have more info for natural tick repellents as I hate the little beasties!! I’d love to learn to make cheese. We used to make yogurt and butter, but have gotten out of the habit. . . . Enjoy this site! Mozzarella is the cheese of choice. Kevin, you are the bomb! Love your blog and all the great info that you put out there for all of us. Would love to learn to make cheese, so I will start with your site and download the recipes to try. I love almost all cheese, but for some reason any type bleu cheese makes me sick. already a subscriber – i learn something new with every post! my son and i love mozz and ricotta. he’s more of a cheese-head than i am and dreams of baked brie and smoked gouda and all the spanish cheeses along with queso fresco, cotija, greek frying cheese, etc. i’ve never tried to make cheese – i’d love to win the kit! I would love to learn how to make my own cheese. I already subscribe and love your newsletter. I have gotten so much info from them. Really enjoy your site and cheese. Interesting association! subscribed recently, tx so much for such an enjoyable, information filled newsletter each week! a friend makes a very yummy, soft herb goat cheese and this offer inspires me to try my hand at cheese making. and yes, i remembered to “like”! I never made cheese. I would love an opportunity!! I love all cheeses!!!! Yum!! Fresh mozzarella heated over most any kind of bread……some fresh basil marinara to boot……yum. I LOVE Cheese! Mozzarella is delicious and would love to make some! There is nothing like fresh mozzarella–it goes best with everything I grow in my garden! It is difficult to pick a favorite cheese. I guess it would be between feta or goat cheese. I always have them on hand along with parma & mozzarella. I don’t remember how I found your site ( I think a friend sent it to me??? ), and I love it. I tell lots of others about it. So I’m just saying “HI.” I hope the computer picks me. I am a subscriber and would like to enter the drawing. I like Provolone cheese on my sandwiches. I’m a subscriber also. I’d love to make chevre! Already a subscriber! The recipe for homemade cream cheese sounds awesome! Will try the homemade mozarella too! it’s good the recipes are sized for sharing! one question though….how long can you store these cheeses?? i’ve heard you can freeze cheese; does that work with these recipes? My brother-in-law was kind enough to introduce me to your blog months ago so I’ve been a subscriber for a while now. I love your recipes and garden tips, but I love, love, love fresh mozarella cheese and if I could make it myself, that would be wonderful! Thanks for all your great ideas. We love cheese and making our own would be awesome! Home made is always better! I love nearly any kind of cheese. Making my own would be so much fun!!! Hi, I’m a subscriber & really enjoy your posts. My “favorite” cheese is whatever variety I’m eating! I love all kinds of cheese & look forward to making my own someday – sounds like fun. Thanks for the giveaway, too! I am new to your e-mail list and enjoy getting each one. I like just about any kind of cheese. Hope I win, I would love to make my own. We like all sorts of cheese. I think we use Mozzarella the most, making lots of homemade pizza. I love Mozzarella cheese the best! I also love you e-newsletter! Thank you! Hello! I’d love to make mozzarella cheese! I’ve tried it and it turned out okay, but I’d love to try the kit! Someday I would love to learn how to make goat cheese! I love fresh mozzarella with basil and tomatos from the garden. I love fresh mozzarella. My sister makes goat cheese and I have a few friends with goats who give the milk away. I’d love to give it a try. I get your very pleasant and helpful online newsletter, but am fairly new to it. I am a vegetarian, so I was very happy to see that your cheese kit makes cheese with vegetable rennet! Thanks – sometimes that is hard to find! By good fortune I stumbled on your website a few days ago and I have to admit, I have been devouring all the useful information you have posted. I just subscribed to your weekly newsletter, and am looking forward to receiving them. I just want to congratulate you on your successes, and say once again thanks for being an inspiration! I hope to achieve some success, and hope to over come some past hiccups with the deep south Texas weather. I am a subscriber and really love reading your news letters!! My most favorite cheese is Muenster, but it is so hard to choose just one, mozzarella and garlic and dill cheese curds are right up there. I really never even thought to make my own cheese! Would love to give it a try. I have never made my own cheese–yet. Mozzarella would be my choice of what to make. I love Havarti, so good, and deep flavored. Never thought I would even try making cheese but since finding your site I am having all sorts of new ideas. I will be making your Naan today, looks so good and easy. Thanks for sharing your knowledge with us. I just say cheese please! Thank’s for the opportunity to enter your drawing! I’m a subscriber and love this newsletter and website. Would love to make my own ricotta and mozzarella. Our family loves cheese….it’s great with your naan bread! Thanks for all the great ideas and thanks for having this drawing and the opportunity to enter! Thanks for your blog, it’s great info for those of us who still love to cook and garden like it’s 1859. Great blog you’ve got here! Very good information – and I am looking forward to making cheese. Hello! I would LOVE to win the cheese kit. We just switched to RAW dairy this past year and our bodies are loving it! I’ve expanded my knowledge of the kitchen and want your kit to continue! I even planted a garden for the first time! Thanks for all your tips. Would love to make cheese. I recently found your site, and have been absolutely loving it! My recent favorite “cheese” is skyr, which can’t quite decide if it’s a really thick yogurt or a really soft cheese. I have to say that Gorgonzola has to be one of my all time favorites! And thank you so much for all the garden info and great recipes! I am learning a lot here! I subscribe…and I think a mozzarella would be great to start. Thanks for offering a unique giveaway! Scrolling forever and thinking of a Soap Opera called What are the ODDS? Slim to None ! I’m already a subscriber and would love to have the cheese kit ( hint, by a couple more next time ) lol..
With all going on in the world, this is where I come to relax and learn and hopefully share new tips. My gardents are not as fancy as yours, but have loved growing things my whole life and have been mainly organic for over 30 years. Really only got away from vegetables and “house plants’ in the last few years.. Older age has slowed me down enough to appreciate flowers, trees and shrubs. Also have picked up bird appreciation (watching) so I plant more and more for the birds. We just moved ( less then 2 yrs ago ) to this region of the Country, N. Fl. and it hasn’t been too much fun getting used to this soil here.. slowly but surely I am mastering it when the old back lets me. I will garden to my dying breath. Nothing gives me more satisfaction and peace than gardening, even though it is hard work and I now need a bit of help with the heavy work! Keep up the great Website, I love it here ! I like a number of cheeses ( raised in Midwest ) and dairy was large part of our diet growing up in the late 40’s, 50’s,. and 60’s. Believe it or not Dairy was very inexpensive back then, not like today. etc. and would love to master cheese making of my own. Great Giveaway Idea Thanks for the opportunity and sharing your knowledge ! Mozzarellaaaaaa YUMMMMMOOOOOOOOOOOOOOOOOO. Love this site, thanks for your newsletters. Not only do I love being a Domestic Goddess, this would be an excellent activity with my mother-in-law, who has early Alzheimer’s. Well, OK, we also love cheese! I don’t think there’s a cheese we don’t love, but probably Mozzerella would be enjoyed the most! Cheddar or Colby would be a close second. I love the idea of making our cheese so we don’t get lots of unnecessary additives. I try to cook wholly natural foods, organic, etc. I am convinced it is healthier for Mom! Thanks for your great blog – glad I found you! Love homemade cheese I hope I win because it’s been ages since I made my very tasty mozzarella grilled cheese. You can only make it with really fresh mozzeralla. Everyone at my house loves parmesan cheese drizzled with aged Italian balsamic vinegar. I have been a Facebook fan for several months and I’m so delighted to have found your blog. LOVE it to pieces!! My favorite cheese is mozzarella and I’ve never had the chance to try fresh, homemade, so that would be an entirely different experience, I’m sure! Thank you for your awesomeness. And hang it from trees!!! I love mozzarella, and most other cheeses. I just subscribed to the email list. thanks for a chance to win the kit. I haven’t made many cheeses but my favorite of what I have made is quark which is made from buttermilk . I like provolone the best, but mozzarella is a close second. Hi, subscriber and lover of everything cheesey! Hello! I love your website! So many great things. Thanks for all the ideas, recipes, etc. I would love a chance to make my own cheese! I love most cheese 😉 I subscribe to your newsletter and have recommended it to others! Thank you! This morning, http://www.random.org selected comment #269. Congratulations, Larry Doyle! I’m a beginner. I ordered 2 books with recipes for butter, yogurt, sour cream, cream cheese, ricotta and other cheeses.. Yesterday I made homemade sour cream for the first time. It turned out great, so I’m encouraged. I have a source of raw milk and I’m ready to start making cheese. Extra sharp white cheddar, mozzarella and ricotta are among my favorite cheeses. I love cheeeese and I love your idea of a ‘kit giving’ !!! Its a good one! And yes, I would love to win the fabulous cheese kit! Thanx for the chance to do so! My daughter loves mozzarella, especially fresh! We are planning to try cheese making this summer while she is home from school. Thanks for the chance to win this kit, and for the amazing blog. It has been very helpful in the short time I have been subscribed! Cheddar, very sharp. If you haven’t tried the buttery goodness that is Stickleton Bleu from Zingermans’ though, you haven’t had the best yet! I am becoming a fan of good ricotta! Oh, my goodness, why didnt anyone say Cheeze Whiz? (Joking) . I love mozzarella. I may try to find one of these kits and try my hand. I never win anything! I’ve been fearful of trying cheese making, so I’d love the opportunity to make it with “training wheels”. This would be SO wonderful to own! Thank you for all your advice, recipes, giveaways and for this site! Buongiorno, Kevin! I never knew Mozzarella & Ricotta cheese making could actually be this easy. And, you made it so – thank you! I printed out your how-to-s. And, now there’s a contest – yippee! My Italian Grandmother would visit all the way from New York City to California when I was young. We would try to contain ourselves until she opened her suitcase. Out would come two wrapped balls of fresh mozzarella. She’d slice, we’d add salt and pepper, and everyone would die and go to heaven as we savored the “real” deal straight from Little Italy. Would I ever love to replicate that experience on my own!